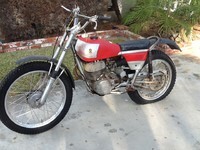 Congratulations to Kenny Easton of Fullerton for winning Bike of the Month with his 1971 Bultaco Sherpa T Model 49. Kenny won a trophy provided by Russ Brown Motorcycle Attorneys. Kenny bought this Bultaco trials bike off of Craig's List back in October 2017 and started the restoration in January. His goal was to finish the restoration in time for the Steve McQueen Show last week which he did, and won first place in his division. The bike has several hand fabricated parts including the front fender braces, the aluminum number plate and skid guard. Kenny has many hours into forming and polishing the braces alone. All of the chrome has been replated, the badges are all new and all of the aluminum parts have been polished to perfection. Kenny has two other Bultacos, a 1977 Bultaco Sherpa 350T and a 1977 Matador Dual Sport. Along with these he also owns two Husqvarnas. Back in October 2017, Kenny took Second place with his 1977 Bultaco Sherpa 350T. Thank you Kenny for bringing your Bultaco for all of us to see. See all the photos in our June Gallery.